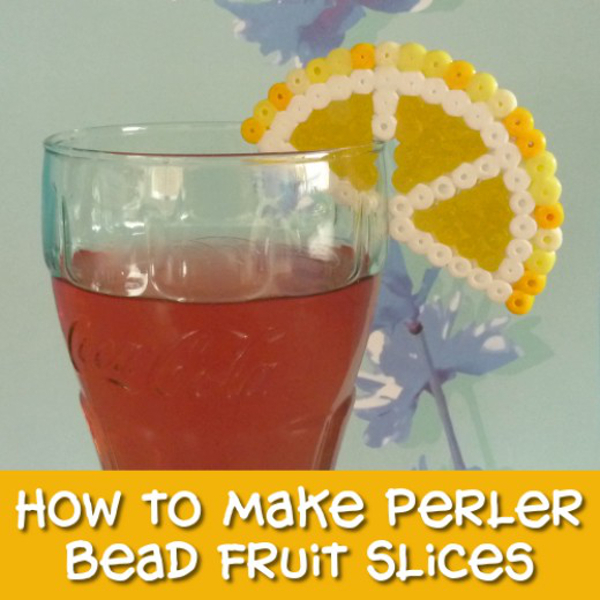 Here's an easy step by step photo craft tutorial for you to make some Perler bead fruit slices. This is a great summer themed craft made from fused Perler or Hama beads using a circle pegboard. Great for making real drink glass slices and also coasters too. These fun fruity slices are so easy for you to make up with fused Perler beads. They also make for a really awesome summer themed craft, especially since you can quickly turn either whole sliced designs into round coasters or mats for drinks. See how I turn my Perler fruit slices into some very cute drink decorations that really do sit right on the top of a drinking glass - just like the real thing. These quick and easy to make crafts are just perfect for party and poolside fun. If you've never actually worked with these small plastic beads before, you may want a bit of a primer on what they are and how to use them. Otherwise, this makes for an easy how to tutorial that you can use to make up a number of cute items with. My Perler bead fruit slice shows the colors for a lemon but you can also use lots of summer themed colors like lime, hot pink and orange to whip up a whole batch of citrus fruits. These make ideal DIY Perler party favors. Step 1: These citrus fruit slices make use of a small, round pegboard but you can also use a larger one to create the same designs. Note that I've highlighted the bead pattern in yellow so you can see this design much more easily but this part, which is the pith, needs to be worked in using white beads. This design will make half a slice - you can see a pattern for a whole slice further down. Work this pith section onto your own circle pegboard. It is fairly straightforward because you make a row of beads almost across the whole midpoint and then follow the circle around. Step 2: Making the outer edge of the lemon (or other citrus fruit) skin. You can use a single flat color for the edging but I really love the look of using 2,3 or 4 different shades of creams, yellows and pale orange. Using more than one shade of these sunshine yellow bead colors gives you an overall impression of a more realistic looking lemon skin. Adding the beads randomly around the edge instead of in a fixed pattern does give a more natural look. Step 3: Once you've done the outside edging, it only leaves the segments of fruit in the triangular areas to fill in. You can choose a solid color yellow to fill in the fruit segments but I really love the look of the translucent beads you can get. I used yellow glitter beads which have a really juicy look to them and are ideal for the insides of fruit patterns. Step 4: The half slice is fun but you can easily turn that into a whole fruit slice pattern by following the same design on the other side as I have here. These will make small drink coasters once ironed and fused together or use a larger circle board and extend the pattern to make larger coasters and decorations. Step 5: Turning your half citrus slice into a drink decoration is easy. You just need to work the pattern from steps 1 - 3. Then you remove 4 beads from the white pith pattern on the pegboard. I have drawn around the beads to remove in the photo so you can see this area more clearly. Removing these 4 beads gives you a perfect gap so that you can use your finished design to decorate the tops of drink glasses. See the photo below. Fancy ice and a slice? Here's the completed design which you can see fits on a standard glass perfectly. Decorate your drinks for a summer party with slices of orange, lime, lemon, pink grapefruit and more. And why not add in a matching coaster too. Here's a full slice of lime. This uses the same method as the lemon fruit slice but using a selection of green colored fused beads. Here's a selection of Perler fruit slices and other summer fruit patterns I've made. You can see links to other fruit pattern tutorials just below. Have fun making these designs.